This groom t-shirt is great for a bachelor party or just to mark the future husband. 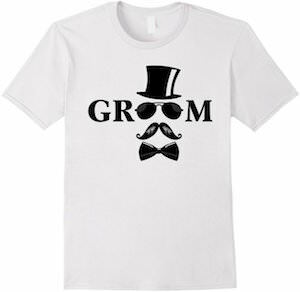 On the white shirt you can find the word “Groom” but the two o’s are also eyes with glasses and besides that their is a hat, moustache and bow tie to give the shirt a face. You can get this groom t-shirt in men’s sizes Small – 3XL. The t-shirt is made from 100% cotton so that it is perfectly comfortable. Now you can make it easy to find the groom to be just make him wear this fun t-shirt and you are ready to go party. Are you organizing a bachelor party? If so then this is the t-shirt you need for the bachelor. This is a black t-shirt with on it a yellow warning sign that says “Warning Bachelor Expiring and the date” and you can adjust the date so that it says what it should say. Just imagine going to a bar with the bachelor party when wearing this t-shirt. It will be fun and the bachelor will get some extra attentions from the people around. 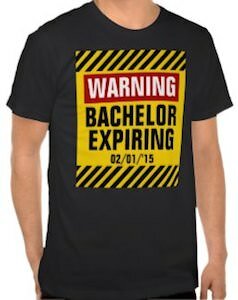 I would say start planning that party and order this Warning Bachelor Expiring T-Shirt.